NASA’s Curiosity Mars rover, which touched down in 2012, experienced a “hiccup” while booting up last week — but scientists on Earth have brought it back online and are working to reconstruct what went wrong. 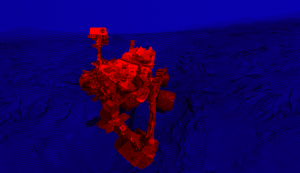 After a weekend of inactivity, mission control successfully brought the rover back online. But that doesn’t mean Curiosity, which is probing whether the Red Planet could support life, is out of the weeds yet — especially just weeks after NASA gave up hope on resuscitating its Opportunity rover. Scientists back on Earth are working to forensically reconstruct what happened during the hiccup by downloading a snapshot of its memory. They’re also taking a hiatus from its scientific work — which is frustrating for researchers, Space.com pointed out, because they’d been about to drill an “intriguing rock” about 650 feet from the rover’s current location. Editor’s note: An earlier version of this story misidentified the year Curiosity landed on Mars. It has been updated.